It was high time for another cake around here. The one thing I get asked to make the most here on this blog is more cakes! So I happily obliged. Plus, there’s just something so satisfying about making cakes, you know? 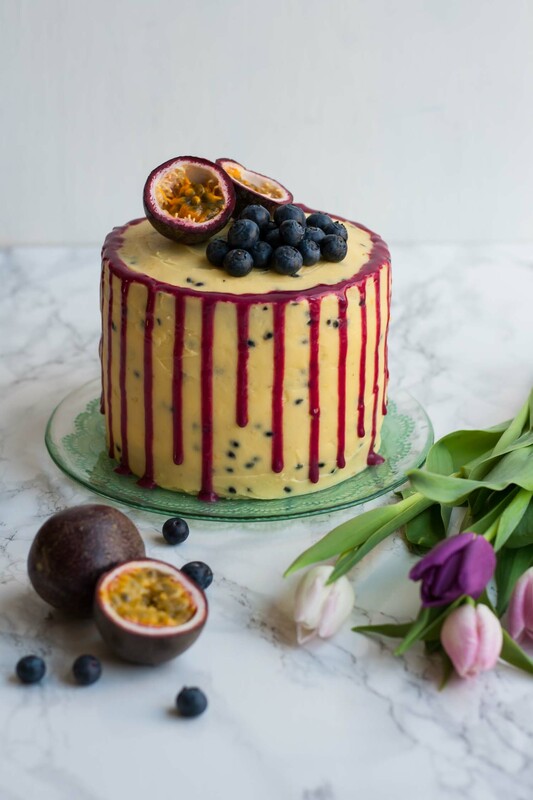 I wanted to make something cheerful to celebrate the arrival of spring and this Blueberry Passionfruit Layer Cake ticks all the boxes! It’s bright, fruity and definitely full of the joy of spring (and summer?! It’s certainly felt like summer here this past weekend!). Passionfruit is one of those flavours that I absolutely love, yet rarely think about using. I’ve used it once before here on the blog, in this Passionfruit and Elderflower Fizz (which you should definitely make) but it’s tropical tang also lends itself really well to a cake. I wanted to try pairing it with blueberry because aside from the stunning colour, it just seemed like a fascinating combination! And it really worked! 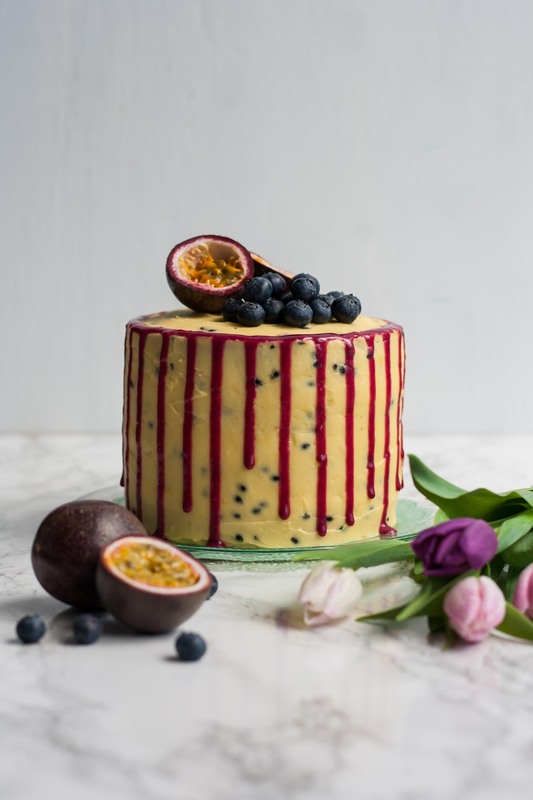 Oh, where to start with this Blueberry Passionfruit Layer Cake? I’ll start with the blueberry vanilla cake layers. I used a basic sponge cake recipe and stirred in a whole load of fresh blueberries. I also boosted the vanilla extract and the result was heavenly! Despite having berries throughout, the sponge was light and fluffy and in no way dense or soggy! And a bonus of having the fruit in there was that it prevented the cake from going stale too quickly – which is great if it stays around that long! Honestly, it was hard not to gobble these up before I’d even put the frosting on! Next up, the frosting. I went for a classic buttercream frosting here – which was delicious – although it’s arguable that a cream cheese frosting would have been that bit better. I debated between the two and ended up settling on the buttercream. It worked incredibly well and I got rave reviews from my taste testers but it was perhaps a tad too sweet for my palate. I’ll let you decide what works for you. I originally intended on straining the pulp from the passionfruit and just using the juice in the frosting, because I wasn’t sure how the pips would go down. However, the flavour just wasn’t coming through as powerfully as I’d have liked so I went ahead and added all of the pulp. The intensity of flavour was so much better this way and the pips added a pleasing texture, but again, it’s completely up to you! I also tinted the frosting slightly with a touch of yellow food colouring to make it extra sunshine-y. I finished off the cake with a blueberry glaze. I know that the drip effect is best achieved with a chocolate ganache but I chose to try my luck at a simple sugar glaze instead. And it worked out pretty well, I think! You need to take care to ensure you have the right consistency and that you’re not over-zealous when pouring it over, but other than that it was pretty easy. I do think that a white chocolate blueberry ganache would have been epic too, though. And you know how hindsight is so wonderful? In retrospect, I wish that I’d have glazed the entire top of the cake, but that idea only came to me as I was looking at the photos. Oh how my perfectionist side twitched at that! But hey, it’s good enough. And what’s more, the cake tasted amazing! You win some, you lose some, hey? The only other thing that I would have done differently is sandwich the cakes with some blueberry curd or blueberry jam as well as the frosting, but now I’m just nitpicking. 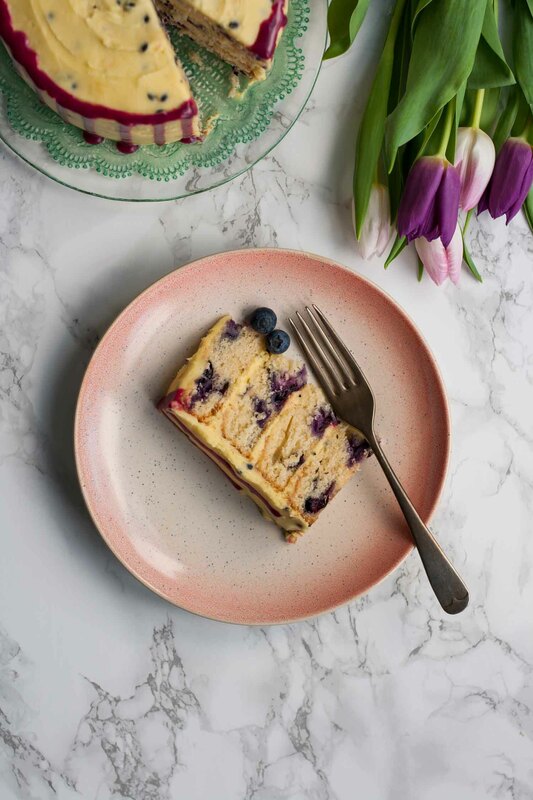 This Blueberry Passionfruit Layer Cake would make the perfect centrepiece for any occasion – Easter is right around the corner so why not serve this up for dessert? I do hope that you’ll give it a try and if you make any changes I’d love to hear about them too! Please tag me on Instagram @eatloveeats or using the hashtag #eatloveeats if you make the cake – I absolutely LOVE seeing your creations! And speaking of Easter, what will you be eating? Do you have a traditional meal you like to eat each year or do you like to mix things up? And most importantly, what are your favourite Easter sweet treats?! Cake? Chocolate? Hot cross buns? I might make something else and post it here if I have time – is there anything you’d like to see? Let me know in the comments! Preheat the oven to 180°C/160°C fan/350°F. Grease and line 2 (or 4 if you have them) 6" round cake tins. Using a stand mixer fitted with the paddle attachment or an electric hand mixer, cream together the butter and sugar until pale and fluffy. Make sure that your butter is at room temperature! Beat in the eggs one by one, mixing well to combine between each one. Add a little of the flour between each egg too, a tablespoon or so will do. Mix together the remaining flour and baking powder and add this to the butter/sugar/egg mixture. Mix in until just combined - don't over whisk or the cake will be dense. Mix in the milk and vanilla extract. 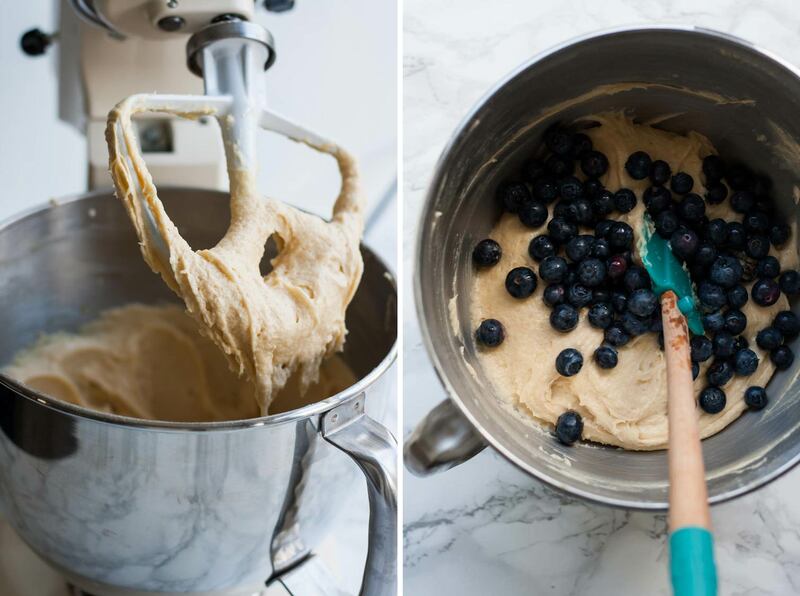 Gently fold the blueberries into the cake batter. Divide the batter between the cake tins. If you have two tins, you'll have to do this in two batches. I find it easiest to weigh the batter and divide it that way but that's up to you. Bake the cakes for 25 minutes or until lightly golden and an inserted skewer comes out clean. Leave to cool for 5 minutes in the tins and then remove and place on a cooling rack to cool completely. In a stand mixer fitted with the paddle attachment or an electric hand mixer, beat the butter with the icing sugar until pale and fluffy. Add the pulp of the passionfruit and beat in until well combined. Rinse the blueberries and place them in a small pan. The water clinging to them will be sufficient to help them cook down. Over a medium-low heat, cook the berries until they pop and release their juices. Press the cooked blueberries through a fine sieve so that you're left with the purple juice. Whisk in the icing sugar to create a bright magenta glaze. Place one of the cooled cakes onto a cake stand. If you have a turntable stand, this will help to frost the cake but don't worry about it if not. Spread a few tablespoons of the frosting on top of the cake and then place another cake on top. Repeat until you've used all 4 cakes. Spread a thin layer of the frosting all over the cake. Place in the fridge for 30 minutes or so. Spread the remainder of the frosting evenly all over the cake. Using a palette knife, scrape the frosting so that it is even all over. You can leave it more rustic though if you prefer - it's totally up to you! 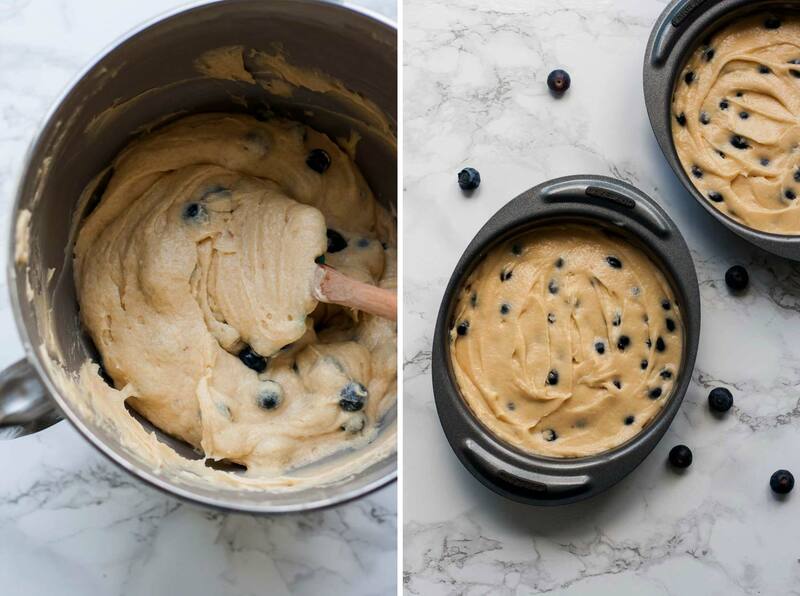 Using a teaspoon, carefully drizzle some of the blueberry glaze around the outside of the cake. Place a drop on the edge of the cake and let gravity pull it down to form a drip. This takes a little patience! The recipe as written should yield a glaze which is an ideal consistency, but of course things might turn out differently in your kitchen so be mindful that you might need to add a little water or sugar to loosen or thicken the glaze. Take care not to drop too much glaze at a time. I am loving everything about this cake! The blueberry glaze dripping down the sides is so lovely! I’ve never used passion fruit. If I can find some, I will definitely be making this cake. The colors are beautiful. It’s almost too pretty to eat. Almost, because I love cake. Thank you for the sweet comment, Patti! I sure hope you can find yourself some passionfruit! Let me know how you get on if you make it! I love how the blueberries make the cake last longer! I don’t make cake very often because it always takes a lot out of me for some reason and then it just gets stale before I can eat it all! I also love how the drizzle is blueberry syrup instead of ganache, it came out looking great! Wow! This cake look phenomenal!! Love all the flavors here! That’s so kind of you Jenni, thanks! What a stunning cake! 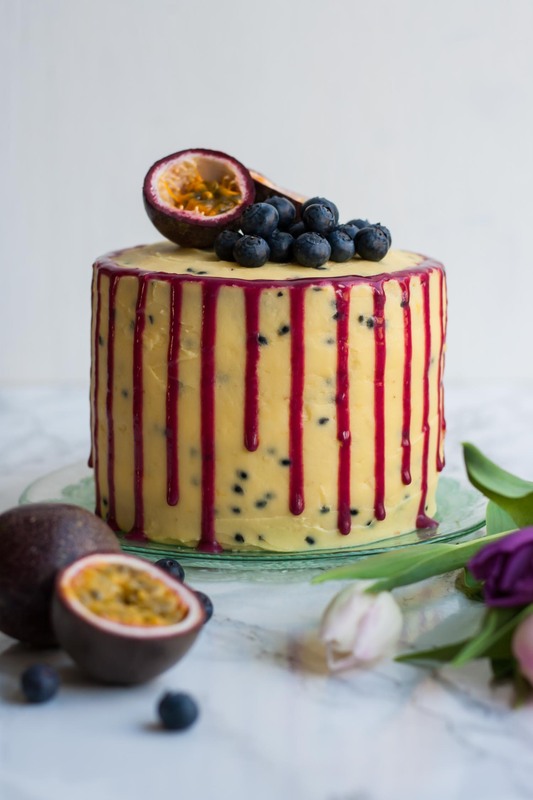 I’ve actually never had passionfruit but this cake is making me want to try it out! Thank you Christine! I seriously urge you to try passionfruit – you’ll love its zingy tropical flavour! This sounds delicious and I love the colors! Passionfruit is a favorite flavor of mine as well, but I don’t ever make anything with it! I need to change that and this cake sounds like a good place to start! I love making cakes but there is always so much left over. How fun to make a 6 inch cake!! I always think passionfruit looks a little odd when you open it but the flavor is so great!! What a stunning cake and perfect for Mother’s Day! Thanks Jennifer! Yeah, 6 inch cakes are the best! And I know what you mean! I always think I’m going to hate the texture but it’s just so good and the flavour is unreal! Hi Sasha, I liked your style , i mean you are extremely good at writing also the Pictures are amazing. I had one Question that if we don’t use the EGG is it okay? I mean the taste and quality will it remain the same? Thanks Supriya! Unfortunately, the egg is vital to the texture and result of the cake. You would be welcome to try omitting it to find out how it turns out, but I wouldn’t recommend it. I’d suggest trying a dedicated eggless cake recipe instead. This cake looks absolutely amazing. We’re doing a bake off challenge at work, and I have the category of fruit – I came across this recipe in my search for something different and am going to give it a go! Will it keep out of the fridge?